This, as many of my pasta dishes, was a 'whatever is in the fridge and needs to be eaten' dish. Tasted delicious! I'm sending this one off as my entry for this weeks Presto Pasta Nights, hosted this week by Gay of Scientist in the Kitchen. Thanks Gay! Super cute name. You've got to love clean-out-the-fridge pastas. Especially when they involve pork! Love the name, love the look, and love the flavor. 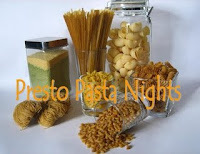 Thanks so much for sharing with Preston Pasta Night. I can't believe I didn't get to it until now. I'm hosting this week's PPN and would love to get another tasty treat with a cool name and glorious photo.